Plenty of us would love a robot to follow us around, perhaps as company or to do all the chores, but not like this. The Gestural Interactive Robot (G.I.A.) follows you around in order to engage you, and records your facial expressions. G.I.A. by Daniel Jay Bertner is a stationary sculpture, and is actually mounted to a wall. It can move, though, thanks to three arms controlled by servomotors. G.I.A. interacts with people and its surroundings via a webcam, which sends motion information back to tracking software on a computer. Facial recognition software then maps out the person's face, and works out how they are feeling. 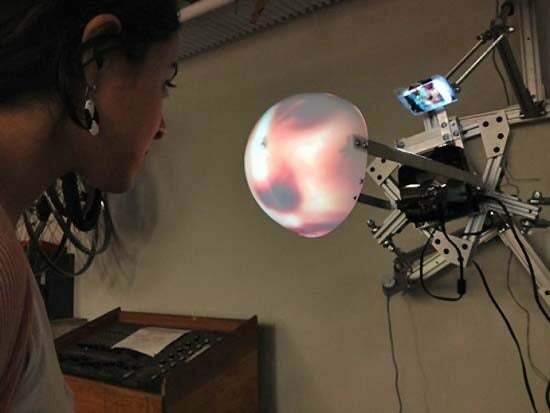 If a wall-mounted robot following you around isn't weird enough, get this: The large orb-like object on the front is a projector, which displays your face and the emotion conveyed. Basically, it's like you're being watched by yourself as you take a walk around.